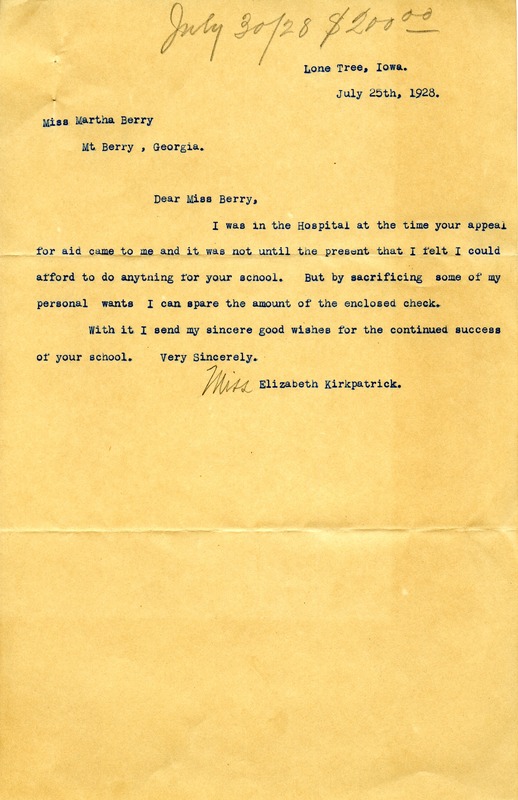 In this letter Elizabeth Kirkpatrick tells Martha Berry that she was in the hospital at the time of her appeal but that now she is better she will send some money for the cause. Miss Elizabeth Kirkpatrick, “Letter to Martha Berry from Elizabeth Kirkpatrick.” Martha Berry Digital Archive. Eds. Schlitz, Stephanie A., Meg Ratliff, Jordan Brannen, et al. Mount Berry: Berry College, 2012. accessed April 21, 2019, https://mbda.berry.edu/items/show/8163.